Welcome to the 3rd International Conference on Driver Distraction and Inattention (DDI2013), featuring: keynote speakers, plenary sessions, and presentations on theory, measurement, effects, crash risk and prevention/mitigation. It includes special symposia on current research and mitigation challenges, and brings together basic and applied research, the latest policy developments, priorities for research and countermeasure development - and more! Driver distraction and inattention are significant road safety problems worldwide. 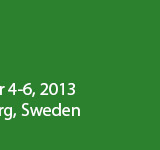 DDI 2013 aims to bring participants up-to-date on recent developments in the field. On the one hand, there is an increase of connected lifestyle and connected-car functionality (smartphone and on-board apps) for information and entertainment, and on the other hand, there is an increase in driver assistance and automated driving functionality for safety. Many stakeholders are developing countermeasures to improve attention – regulation, design guidelines, consumer electronics innovation, and vehicles that will not crash. DDI 2013 will bring into the spotlight relevant developments in research from mainstream and neighbouring disciplines, and showcase new and emerging technologies, products and countermeasures. It is the premier international conference on this topic, bringing together all stakeholders – researchers, policy makers, vehicle manufacturers and many others. The conference features keynote speakers, plenary sessions, and presentations on theory, measurement, effects, crash risk and prevention/mitigation. It includes special symposia on current research and mitigation challenges, and brings together basic and applied research, the latest policy developments, priorities for research and countermeasure development - and more!